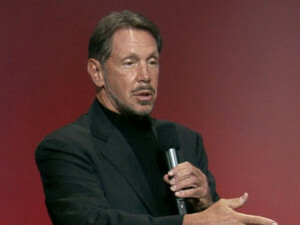 Amazon's cloud lead is over, says Larry Ellison, Oracle chairman and CTO. Oracle chairman and CTO Larry Ellison has taken the cloud computing war to rival Amazon Web Services, saying its lead in the infrastructure-as-a-service market is over. Ellison was speaking on Sunday in a keynote address during the Oracle Open World 2016 conference at the Moscone Centre in San Francisco. Oracle, traditionally a database company, is making aggressive moves in the cloud space as customers increasingly shun the costlier licensing model. Last week, Oracle said its decision to migrate to the cloud and away from on-premises systems continues to be a successful strategy. The company recently agreed to buy NetSuite for about $9.3 billion, in a deal that gives it a bigger share in the fast-growing cloud computing business. The deal could help Oracle, which is aggressively trying to build and sell more cloud-based business software, play catch up with competitors such as Workday and Salesforce.com that specialise in cloud-based offerings. "Amazon's lead is over. Amazon's going to have serious competition going forward," Ellison said. "We are in the middle of a generational change as computing moves from on-premises to cloud computing," he said. "Cloud computing has ushered in a new era of utility computing, just like electricity. "The world of IT has changed - the people you work with and buy products from are different from five years ago." He boasted that Oracle competes in all three levels of the cloud - software-as-a-service, platform-as-a-service and infrastructure-as-a-service. "We started by offering applications-as-a-service. This year, you will see us progressing into infrastructure-as-a-service." According to a recent report by Synergy Research Group, Amazon Web Services, Microsoft, IBM and Google combined control well over half of the worldwide cloud infrastructure service market. The group says the companies also continue to grow more rapidly than their smaller competitors. In aggregate, the big four grew their cloud infrastructure service revenue 68% in Q2, while the next 20 largest cloud providers grew by 41% and all other smaller providers grew by 27%. The market as a whole grew by 51%. Amazon remains in a league of its own, almost three times the size of its nearest competitor and with a clear lead in all major regions and most segments of the market, says Synergy Research Group. "We are in the process of moving from on-premises to the cloud. This is not going to happen overnight. Even if the majority move their data to the cloud, there is going to be a 10-year period of co-existence where you have data and applications in your own data centre as well as data and applications in the cloud. It is very important that these two things co-exist [so] that your data centre and cloud services can be used interchangeably," said Ellison.